Happy Sunday everyone. I'm here enjoying a low-key afternoon at home listening to Jak FM, a local radio station at Jakarta. I stream it online every time I miss home, and spending Chinese new year without family around really triggers the feeling. I gotta admit, I have more brushes that I actually need. I have, slowly but surely, collected so many brushes but I don't regret it since I got to find amazing brushes that work for me. I first saw Real Techniques brushes at Ulta. I was attracted to its vibrant color and unique design. I then discovered beauty youtubers that now have contributed to my beauty learning process use these brushes. 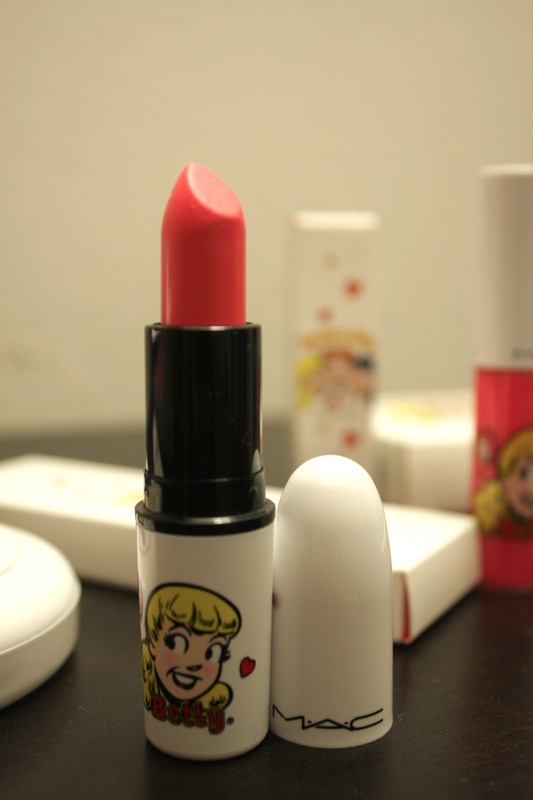 Real Techniques is a brand created by Samanta Chapman, a makeup artist from UK. You might have seen her and her sister, Nic, on their channel called pixiwoo. They both are amazing makeup artists and I really enjoy watching their tutorials and totally recommend them. This is the very first RT brush that I bought. I was obsessed with large fluffy brush for powder application and the synthetic bristles are very soft and great quality. I also like the idea that the brush can stand on its own although it makes the handle bigger and bulkier to store. The first RT brush that really caught my eyes at Ulta. 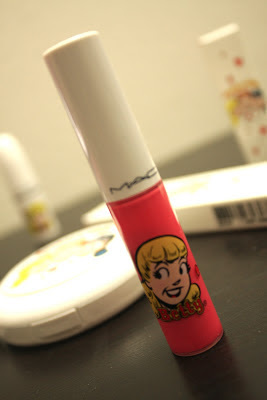 I saw it in action so many times especially on Tanya's (pixi2woo) tutorials. 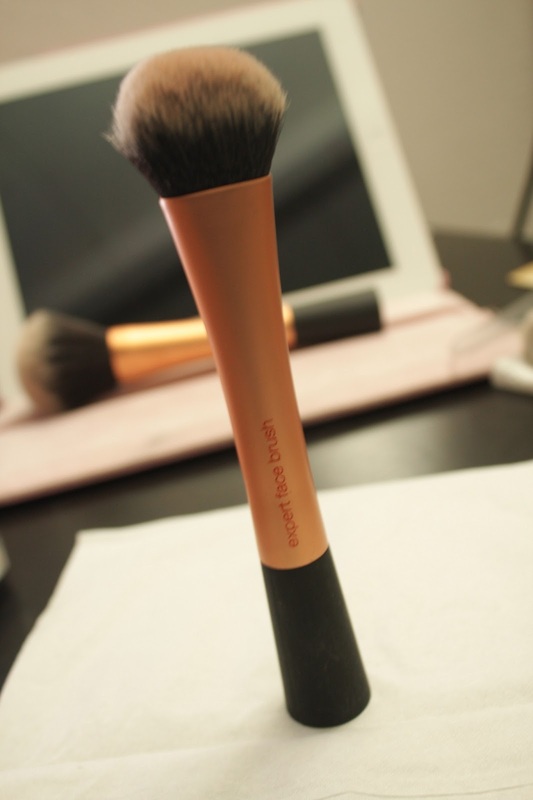 Although it's called a blush brush, it really can act as different things. 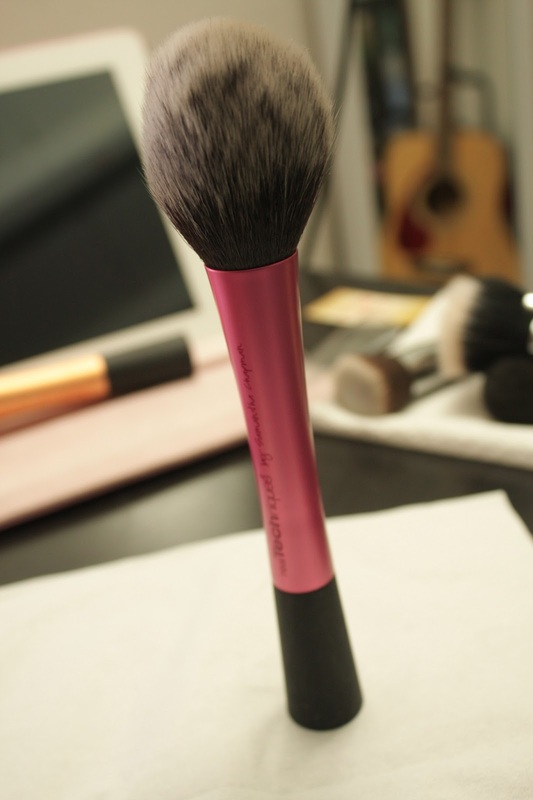 The fluffy bristle makes it easy to apply powder and its slightly domed/tapered curve makes it possible to do contour. The bottom surface is flat so the brush can also stand by itself. I honestly bought this because I thought it would be a great substitute for my Sigma kabuki brush that I always use to apply my foundation. Nevertheless, it fails to do the job as I expected. It's still pretty quality brush, though. Don't get me wrong. It just doesn't work for liquid nor powder foundation application for me. 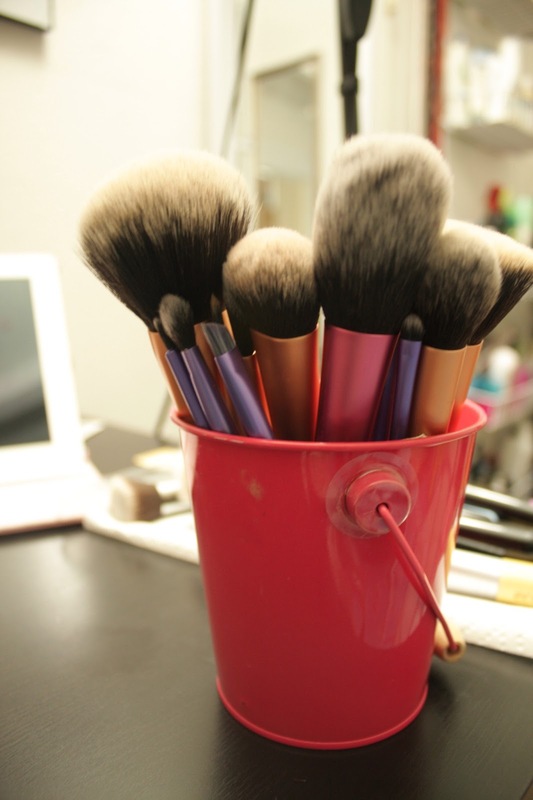 The bristles are very dense and hard so it is a good brush to buff and blend creme products, especially creme blush or bronzer. I saw pixiwoo uses this brush to apply Chanel creme bronzer which is really gorgeous on skin, at least from what I saw. 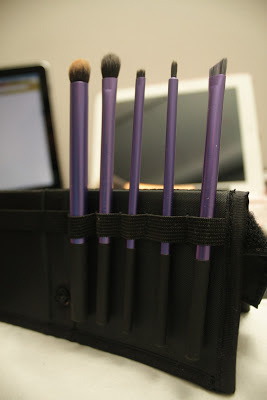 These brushes come in an inventive case that you can convert to a stand and is great for travel. I personally still prefer my Sigma travel cylinder case, but it is more space-friendly. This set comes with 4 brushes. I have to say I'm not really pleased with the set as a whole. I love the buffing brush which works great for foundation. It is less dense than the Sigma kabuki brushes, but it does the job well to blend liquid foundation. But, it works even better for my Bare Minerals foundation which I have been loving lately for more natural look and fast/light application. 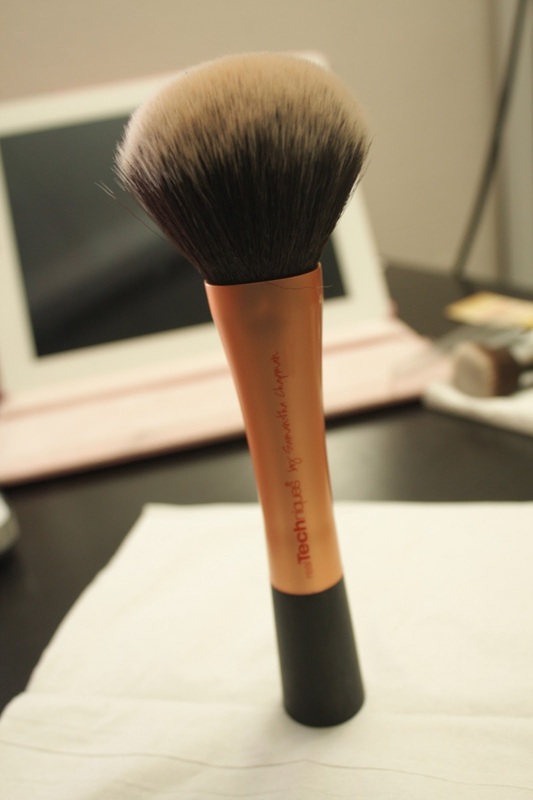 The flat top and slightly dense bristles works great to buff the loose powder and blend it for even application. The contour brush is good to contour your nose especially, but I also find it useful to set my under-eye concealer with powder. The size tapered shape is perfect to reach the slightly hollow areas on your face. As for the rest of the brushes in the set, detailer and pointed foundation brush, I don't really use them much. I especially don't know what I can do with a pointed foundation brush which for me comes in really hard and plastic-y material. The starter set comes with 5 eye brushes and the similar inventive kit with the set mentioned previously. The shadow brushes are relatively large for my taste. The deluxe crease brush is supposed to blend your eyeshadow, but I find a better use out of it which is to blend my under-eye concealer. I see the Pixiwoo ladies do it a lot. They use MAC brushes instead of Real Techniques brushes when they do their eye makeup. So, I don't really understand why, but I don't think these brushes can work as well as my Sigma ones considering its larger sizes. Overall, Real Techniques are really great quality brushes especially their face brushes. I love their individual products but not so much with their sets. It would be awesome if they come up with updated collection especially for their eye brushes. As for now, I will continue using their brushes especially for my eyes but not so much for the original purpose. The eye brushes work great for applying concealer, but I've never tried to apply eyeshadows before because I'm already turned off by the size. I've imagined how messy it will be for my relatively small eyes. Thank you for reading. I hope you find my review useful. Have any of you tried RT brushes before? What do you think? For those who follow me on instagram and twitter might have known already that I got a chance to be an audience on The Ellen Show. I put in my and my boyfriend's names on the website in November without thinking that I could actually get in ever. I've been wanting to meet Ellen for years. I adore her show for it gives laughter and joy when I watch it. About two weeks after I put our names in, as I was sitting at my desk doing my volunteer work I got a call for an unknown number. I let it go to voicemail which I usually do when I can’t ID the caller. The call was from Katie for The Ellen DeGeneres Show. I was surprised and wanted to jump up and down on my chair. She was asking for my boyfriend because his name was the one who got us in. I offered to fill for him, but she told me that it had to be him. So I told my boyfriend to call Katie right away. We got 4 guaranteed tickets for January 31st. Yay! But I soon was worried since I’ve already agreed to start my new job in January just days before. I didn’t want to miss the opportunity of a lifetime (maybe I’m exaggerating a little bit, but it’s Ellen! ), but I also couldn’t miss my job. It’s far more important (at least I am willing to admit it =P). I then emailed the HR manager and told her that I had a previous engagement and whether it was okay for me to miss work. She said it was okay and it was go! So I got 2 extra tickets, 4 in total. I asked my friends around who wanted to go with me. The most enthusiastic response was from Fenny and Marlene and am I glad to have them come with me! We took advantage of the Megabus promotion. My boyfriend and I purchased the bus tickets earlier and we got a REALLY good deal. In total, $6.25 each for a roundtrip ticket San Jose-Los Angeles. How awesome is that?! We went on Wednesday night at 8.20 pm. My friend dropped us off at Diridon Caltrain Station. When we got there it was just 5 minutes away from the scheduled departure, but the Megabus was nowhere to be seen. We were panic a little bit thinking we might have missed the bus or something. But not long after that, we spotted the two-tiered blue bus drove through just around the corner. The passengers were not more than 15 people. It was really quiet and spacious. We sat on the second floor for the view. The bus was supposed to be facilitated with a free wi-fi, but we couldn’t connect at all. It was a little disappointing. There were green lights all around the bus to keep the path visible at night. The lights did a good job making sure people can see despite the night time but it was really annoying for people who were trying to sleep. Fortunately, I brought my eye mask for sleeping as I always do. The trip was less than 6 six hours including a 10-minute rest stop. I couldn’t sleep at all but managed to rest my eyes for hours. We arrived at Union Station at around 2.20 am. The initial plan was to go to LAX by FlyAway bus because we need to pick up our rental car. The only 24-hour rental car places are near the airport. If we had an earlier trip and got to the Union Station before 5/6pm, the rental car places would’ve still opened and it would’ve saved us a hassle. Anyway, FlyAways bus comes every one hour at night, and we had to wait for about 40 minutes. When we saw there were two cabs we agreed to take a cab instead. The first cab driver talked to us in Spanish. I assumed he couldn’t speak English a world. We said that we wanted to go to LAX and there were 4 of us. He kept responding in Spanish and then pointed us to the cab behind him. Maybe there were friends or something I don’t understand. When we saw the cab he was pointing at, there was a man on the front seat beside the driver. We were confused and again made an attempt to tell the first driver that there were 4 of us. The first driver then talked to the second driver in Spanish. The man in the front seat got off the cab. The driver mentioned something about “Cash Only” and there started our suspicion. It was too late, though. We were already inside the cab. The driver did speak English and understood our response. My boyfriend checked on his phone and found that cab fare to LAX is $45 flat. We also didn’t find any identification inside the cab. When we finally got to the rental place, it turned out that we didn’t have as much cash as we thought combined. The fare skyrocketed until around $78 and going until Marlene told the driver to turn off the meter as we collected our money. We only had $60. So my boyfriend and I got on the cab again and found the nearest atm which was inside a 7-11. I noticed that the driver didn’t turn on the meter when we went to 7-11 but did when we went back to the rental place. The fare totaled for $90. It was such a rip off. It was ridiculous to think that the trip from San Jose to LA only cost us $6 and the trip within the LA cost us 4 times more for each. The horrifying story didn’t stop there. When my boyfriend and I got to the rental place, we found our friends sitting there waiting for us. He asked for his laptop bag because he put the rental workpapers in the bag. I felt my heart fell when I realized that the bag was nowhere in my hand as it was supposed to be when I held it before I went inside the 7-11 for the atm. He immediately calling the cab driver from the name card given. It went straight to the mailbox. He, really exhausted and all, decided to take care of the rental first. Meanwhile, Fenny persistently called the driver until he picked up. Thank God he did and drove back to deliver the bag. It was a reminder for me to be more careful. My boyfriend sighed in relief when he found out. I later learned that not only his laptop, he also had his checkbook inside which would be too problematic to take care of in such dawn of the day. We got to our hotel at 3.40 am. The lobby was really quiet. Fenny and Marlene checked in while my boyfriend and I waited in the car. Then they came back in the car and we found parking. The room was 224. When we got to the room, Marlene put in the card key. The light turned green and she pushed down the door knob. The door was open but the latch, the inside lock, was intact. We thought that there was something wrong with the door. We tried several times, until all of a sudden we heard “Hello” from inside the room. We closed the door immediately and hurried back to the receptionist desk. The lady behind the counter didn’t even state her apology and just handed back the card key once she had switched it to the new vacant room. Finally, we could rest. I went to bed at 5.30am and woke up at 9 the next day. I didn’t sleep well at all. The closer I was to see Ellen the more excited I was.